When a fire decimated the inside of Eastern Market early in the morning of April 30th, 2007, the city lost one of its own best monuments. Built in 1871, architected by Adolf Cluss, Eastern Market was the city’s first enclosed produce markets, a supermarket before Giant, Safeway or Magruder’s were even a twinkle in their founders’ eyes. After 26 months of restoration and renovation, Eastern Market reopened today, with a ribbon-cutting ceremony hosted by Mayor Fenty, Congresswoman Norton, Council Chairman Gray, Council members David Catania, Tommy Wells and Kwame Brown, and former Council member Sharon Ambrose. 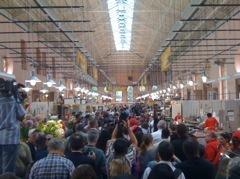 The new interior of Eastern Market features all of the 2007 vendors, from Canales Meats to Calomiris & Sons fruits. The $22M renovation also features, to the relief and delight of all, Air Conditioning and Restrooms. Chief among the renovations, though, is a full fire sprinkler and alarm system designed to minimize damage and alert the authorities. We’ll have a bigger feature on Eastern Market this afternoon in the 3pm Feature slot. There’s free music this weekend at Eastern Market.